I had heard about this book before, mostly good things about it, and so when I came across it at the grocery story while I was shopping with my grandma I skimmed the first few pages and decided that I needed to read it. The book takes place in Japan, and if you didn't know already I've taken Japanese for 6 years, and I TAed for another after I finished my AP class, although by no means dose this mean that I'm fluent at ALL. The book just pulled me in, because I was like "I understand what the heck is being talked about!" which can be really exciting. This being said if you don't speak Japanese there is a glossary in the back of the book to help you out. I really loved the fact that the book was set in Japan (modern day) and that the over three fourths of the main characters were Japanese, because in YA white is most often the dominate race (but then again if you're IN Japan you would expect to see lots of Japanese people and not so many non-Japanese people). The characters felt real to teenagers in Japan, and the description in the novel was beautiful, I could really see/imagine what Katie saw (and I've never actually been to Japan, so you can't say it's because I've actually seen it). 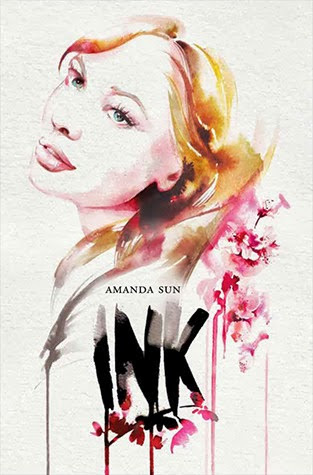 The story was really fresh, to my knowledge it has NEVER been done before anywhere, and the fact that Amanda brought Japanese culture and lore into the book made me really happy. PERSONALLY being a student of the Japanese language little more than a year ago I found a few things about the book a little odd but those were just small things that I saw and unless you studied the language and culture you would probably pass right over them. The other thing was that I'm not one hundred percent sure what was happening all the time, mainly when the ink came into play, not because of the language but it just seemed that maybe I didn't fully grasp what was happening, which totally could have been me. All in all I really enjoyed the book and I'll be sure to pick up the sequel when it comes out...some time next year I would assume. Fans of Japanese anime and manga will probably eat the book up, and if you're interested in Japan or Japanese culture or language I would recommend it to you highly. It would also be great for fans of novels rooted in myth/history, Japanese or otherwise.